Jenna at Speech Room News is hosting a linky party to celebrate the upcoming TPT sale! Although my store isn't even a week old yet, I decided to participate anyways. My little store only has four activities at the moment - but they are definitely worth checking out. My students recently had a blast with this If You Give a Dog a Donut Book Companion: You can find this activity here. ... Read More about Three Million Teachers! I spent Friday night watching Netflix and whipping up a free St. Patrick's Day Activity! Can you say nerd? I have many students who are currently working on pronouns. I think this cute card game is going to be a hit! The directions are simple. The student draws a card and fills in the blank with the correct pronoun. 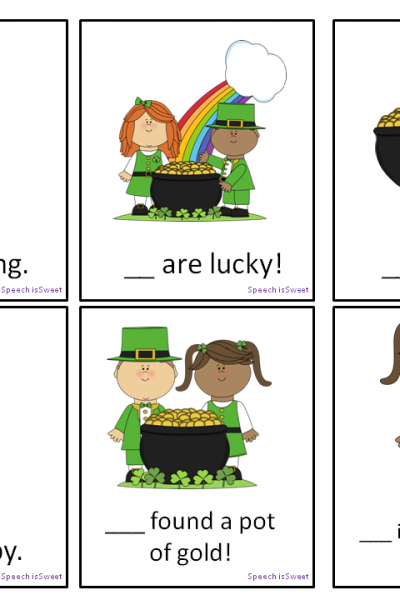 If they are correct they get to keep the card, if they are wrong it goes in a ... Read More about St. Patrick’s Day Pronouns! 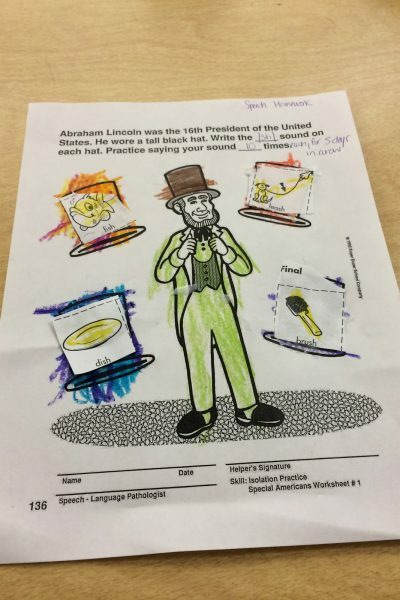 This week in my speech room students have been busy practicing their speech sounds with a presidential twist. I briefly introduced students to our 16th president - Mr. Abraham Lincoln. Of course, my students then proceeded to give him a makeover! I must say, Mr. Lincoln looks rather dapper in a lime green suit! I'm crazy about color, cut, and glue activities. They are a fantastic way to ... Read More about Presidents’ Day Marches On…. Well, looks like you've stumbled across my very first blog post! Welcome to Speech is Sweet! My name is Scarlett and I'm a speech-language pathologist in the Greater Cincinnati area. I've been working in a pediatric setting for almost three years now. Wow, time goes by so fast! Recently, I've also began working PRN in a skilled nursing facility. I love helping people communicate - young and ... Read More about Speech is Sweet!